Celebrate your style at Aloft Houston Downtown, a hip new hotel thats surrounded by multinational corporations, sports venues, and world-class museums and theaters. We offer easy-breezy access to much of the Inner Loop via nearby METRORail stations.Meet & mingle with friends at our w xyz(SM) bar, grab a sweet, savory, or healthy snack from re:fuel by Aloft(SM), our 24/7 pantry, or play in our re:mix(SM) lounge. Plus, you can always stay connected with free hotel-wide wired and wireless High Speed Internet Access!Breeze into one of our Aloft rooms, featuring our ultra-comfortable signature bed, walk-in shower, custom amenities by Bliss Spa, and more. Our plug & play connectivity station charges all your electronics and links to the 42 LCD TV to maximize work and play. Zipping through H-Town on a business trip or carefree vacation? 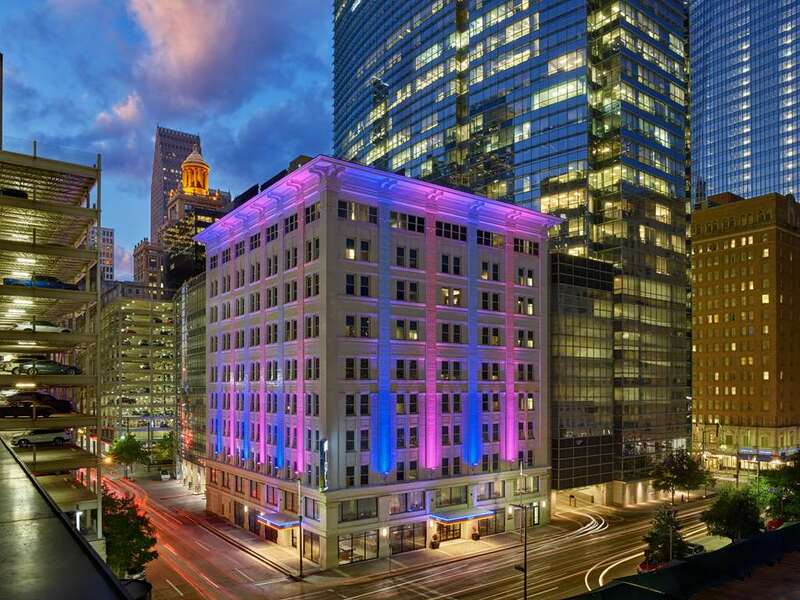 Aloft Houston Downtown offers easy breezy access to the entire area but is light-years from all those run-of-the-mill hotels. Abuzz with the energy of discovery and interaction, this bold new lodging alternative will surely inspire you to explore the best shopping, dining, and entertainment in the downtown area.Stay and play awhile! Youll discover were right in the middle of the headquarters of energy companies and other multinational corporations. Also nearby are natural public spaces like Market Square Park and Discovery Green, which is across the street from the George R. Brown Convention Center. Check out Houstons renowned cultural scene in the Theater District and at numerous world-class museums. Sports fans will appreciate being minutes from the Rockets Toyota Center and the Astros Minute Maid Park.Need local tips? Check out Aloft Houston Downtowns in-touch kiosks in our re:mix(SM) lounge, for easy breezy Internet access to all that need-to-know info. Then ease on down the road and experience the rest of Space City. Clink! Meet, mix, and mingle over cocktails at our always happening w xyz bar. The fun flows freely with everything from pints to Pinot Noirs to specialty sippers, plus a snack-attack menu, mood music, and can t-miss events.